You might think Amazon Web Services would have chilled out in the month before its big Re:Invent conference. After all, that show, which takes place at the end of November, is when the cloud provider typically shows off a bonanza of new products and features. But Christmas has come early in October, at least for people who are looking to run hybrid cloud deployments with AWS. Here's the rundown of important news you may have missed. The big bombshell for the month was a partnership between AWS and VMware. The latter company is going to launch a managed service that will make it easy for people to migrate workloads from on-premises hardware to the public cloud and back again, using VMware's vSphere management software. It's a move that will make it easier for businesses to try out hybrid cloud configurations with a single control plane that administrators are already familiar with from managing their current infrastructure. 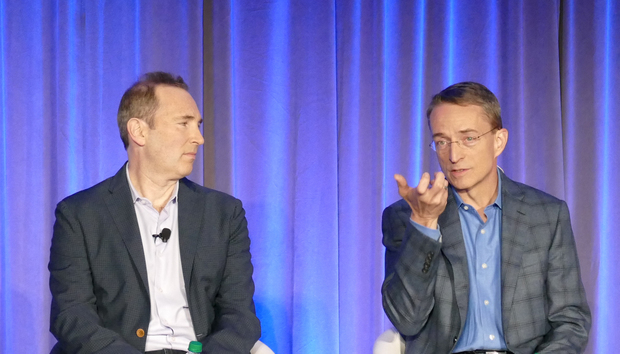 AWS CEO Andy Jassy looked like a cat who had just swallowed a canary sitting on stage next to Vmware CEO Pat Gelsinger during a San Francisco press event to announce the partnership. But both men seemed like they got something important out of the deal. Amazon gets a hybrid cloud strategy, while VMware gets a way to easily integrate its products with a leading cloud provider — and probably make a whole bunch of money in the process. Right now, it's in closed beta, expected to launch next year. But what if you don't want to use VMware's managed service? Well, AWS has a Server Migration Service that's supposed to help lift and shift workloads. To use it, administrators install a connector that will analyze their virtualized server environment and collect information about the instances they’re using. After that, they can use the AWS Management Console to replicate those instances up to the cloud as Amazon Machine Images stored in the AWS Elastic Block Store service. After that, admins can spin up what should be a replica of the same instance running on-premises in AWS. It's among the most expensive compute instances Amazon offers and has been useful for customers looking to run applications like SAP HANA. But what about customers who want half the power? Amazon's swooping in with the appropriately named x1.16xlarge, which sports (you guessed it) 64 vCPU cores, 976GiB of RAM, and one 1920GB SSD. It's priced at half the cost of its larger sibling. Both of those instance types are also now available in Amazon's Mumbai, Seoul and US GovCloud regions, in addition to the seven other regions worldwide that also run x1 instances. Geographic expansion is the name of the game for cloud providers, and AWS pushed its datacenter footprint forward with the launch of a new US-East region based in Ohio. It's part of a one-two punch of cloud regions available in the eastern part of America, alongside Amazon's longstanding US-East region based in Virginia. At launch, the region supports a wide variety of AWS services, including EC2, Elastic Block Store, Aurora, DynamoDB, Snowball, Kinesis and Lambda. Adrian Cockroft made a name for himself as a Cloud Architect at Netflix and then as a Technical Fellow at Battery Ventures. The soft-spoken Brit was a fixture at cloud conferences, and he's now been pulled into Amazon's orbit as its VP of Cloud Infrastructure. AWS CTO Werner Vogels said in a blog post that Cockroft will be working with product teams, consulting with customers about their cloud architecture, and helping out open-source communities.